Cranberry Facts, an information sheet for kids cooking activities. 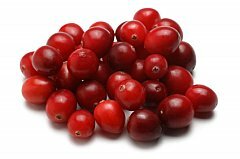 Cranberry facts and general information about cranberries. Cranberries are harvested in September and October. Cranberries can be found on vines that grow low to the ground. Where they are grown is called cranberry bogs. The evergreen vines blossom in white flowers and 2 months later the cranberries are ready for harvesting. Cranberry varieties are light reddark red in color. Many people drink cranberry juice or cook with cranberries at Thanksgiving and autumn time. Usually cranberries are cooked with sugar because they are very sour or bitter. To use cranberries rinse berries off and use in any cranberry recipes. Add dried cranberries to quick breads, cereal or granola. Cranberries are high in calcium, magnesium, potassium, Vitamin A and Vitamin B. In saucepan heat sugar and water and bring to a boil. Boil 5 minutes. Add in washed and clean cranberries. Boil another 5 minutes. Cranberries should pop open. Take off stove and pour into serving dish. Chill in refrigerator several hours before serving. In a saucepan, add lemon juice and apple juice. Bring to a boil. Then add cinnamon sticks, lemon peel and salt. Stir together. Bring back to a boil. Reduce to low and continue to cook 10 minutes. Set aside and cool 15-20 minutes. Meanwhile, in a mixing bowl, place apples, pineapple and orange. Take cinnamon sticks out of juice mixture, then pour juice over fruit. Chill several hours. Serve. To prepare crust, stir together flour, oats, baking soda and salt in mixing bowl. In separate bowl, cream together butter and brown sugar until smooth. Add to flour mixture and blend together. Mix in pecans and coconut with a mixing spoon. Set aside 1 1/2 cups of crust mixture. In baking pan, press remaining crust ingredients in bottom of 13 x9 inch greased pan. Bake crust for 10 minutes at 400 degrees. In saucepan add cranberries, fresh and dried, sugar and water. Cook 10-15 minutes stirring often. Cranberries will pop open and you can mash them while you are stirring. Cool slightly then pour over crust. Sprinkle the reserved 1 1/2 crust mixture you set aside earlier on top of the cranberries. Bake at 400 degrees 15-20 minutes until crust is golden brown. Back to Food Facts page from Cranberry Facts.